Galway is famous for its legendary entertainment, which isn’t just limited to nightfall. From dawn ’til the early hours, expect to experience street art at its liveliest, with an enchanting display of live music and dancing from an eclectic array of instruments – among them fiddles, banjos, guitars, handheld drums and even bagpipes. If it’s not live music, it will be a brightly-clad juggler, a painter, a puppeteer or perhaps a full-on theatrical production. There are plenty of sights in Galway, but the chance to wander around this exuberant city and soak up its charming array of street performances is an experience in itself. It’s worth spending a couple of nights in the city to make the most of the experience. For a fuss-free stay that won’t break the bank, try the Travelodge hotel in Galway – it’s located in the city centre close to the main road networks. In case you’re not familiar with this hotel brand, they’re renowned for their budget-friendly and no-frills hotels, and they now have a growing network of locations across Ireland. You can find out more here. 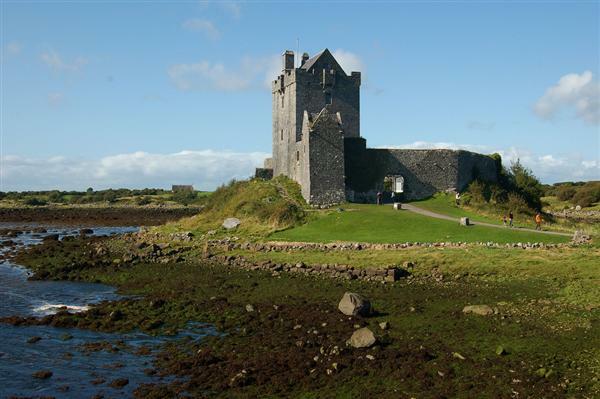 Seemingly marooned on a tiny peninsula jutting out into Galway Bay, the spectacular Dunguaire Castle is quite a sight – and it’s no surprise that it has become Ireland’s most photographed castle. Built in 1520, it features a 75-foot tower and defensive wall which are open to the public during the summer. It also has regular banquets which is a great way to experience this piece of history and get into the medieval spirit. What better way to go to know the city than by delving into its past? Perched on the banks of the River Corrib overlooking the famous Spanish Arch, Galway City Museum is home to a superb range of mementos and relics that tell the city’s story through archaeology, arts, crafts and models. The Galway Civic Sword, which dates back to 1610, is one of the museum’s treasures – as is the prized statue of Padraic Ó Conaire. The museum also offers fantastic views of the Claddagh, the Spanish Arch, River Corrib and Galway Bay. A firm fixture in the Galway calendar, this annual summer festival has developed an international reputation and following, attracting over 400 artists and more than 150,000 people. It’s a celebration of arts both in Ireland and around the world, bringing writers, musicians, street artists, comedians, performers and producers together for a fortnight of cultural activity and celebration. In Galway, you’re never far from a great restaurant, a lively music bar or perhaps a bit of both. Buzzing pubs and clubs heave with live music and dance, and as eclectic tastes go, the city is right up there with the best of them. On any given night you might come across jazz, soul, rhythm and blues, rock, metal or classical performances. Blue Note is a great pub with a penchant for live music, while Monroe’s Tavern is a cheerful, rustic little place with regular traditional Irish dancing. Thought to be an extension of Galway’s medieval walls, the Spanish Arch is a timeless icon of the city and is thought to have originally served as a passageway for ships carrying goods. Another surviving part of the walls can be seen at Eyre Square Centre, which have been woven into the fabric of this modern shopping centre.